Businesses that have engaged in year-end tax planning know that as 2019 approaches, it is time to develop, finalize and undertake a year-end tax planning strategy. 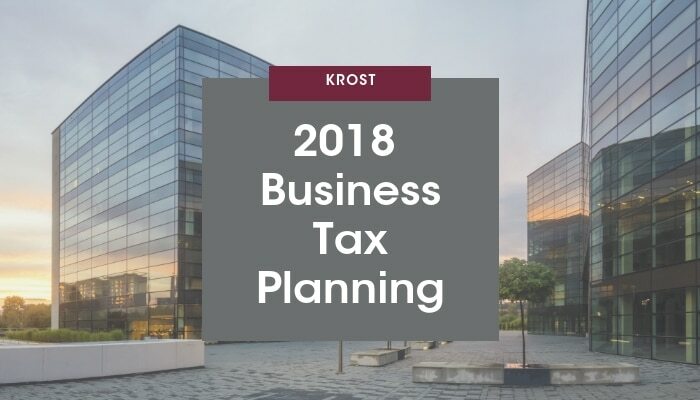 Businesses that have not yet explored year-end tax planning should take an immediate inventory of their situation and develop a year-end 2018 tax strategy. Our office is ready to assist you, whether it be refining past plans or delivering new plans, or a combination of both. The 2018 tax year will be the first year that businesses are fully exposed to the new 2017 Tax Cuts and Jobs Act (TCJA) that will have major tax ramifications for businesses. The corporate tax rate is cut to 21%, the corporate AMT is gone, there are new limits on business interest deductions, and significantly liberalized expensing and depreciation rules. And there’s a new deduction for non-corporate taxpayers with qualified business income from pass-through entities. We have compiled a checklist of additional actions based on current tax rules that may help you save tax dollars if you act before year-end. Not all actions will apply to your situation, but you may likely benefit from some of them. We can narrow down the specific actions that you can take once we meet with you to tailor a customized plan. In the meantime, please review the following list and contact us at your earliest convenience so that we can advise you on which tax-saving moves to make. Among the top two incentives for small businesses are bonus depreciation and the Code Sec. 179 small business expensing provision. These two provisions were greatly expanded with the “Tax Cut and Jobs Act of 2017. Bonus depreciation has been increased to 100% for property placed in service in 2018. Both used equipment and new equipment qualify. The Job Act also increased the Section 179 deduction limit to $1,000,000 from $500,000, where it will remain for all of 2018. These two incentives can provide significant tax relief, but equipment and software must be financed and in place-in-service by midnight December 31, 2018 in order to take the deduction in 2018. Another valuable incentive for year-end planning is the de minimis safe harbor threshold amount under the final “repair regs” for taxpayers. Currently, a de minimis safe harbor under the repair regs allows taxpayers to deduct certain items costing $5,000 or less (per item or invoice) and that are deductible in accordance with the company’s accounting policy reflected on their applicable financial statement (AFS). IRS regulations also provide a $2,500 de minimis safe harbor threshold for taxpayers without an applicable financial statement. The Protecting Americans from Tax Hikes Act of 2015 made the credit permanent. In addition to credit permanency, the legislation also expanded the research credit making it a much more effective tax planning tool for small and mid-sized businesses. Eligible taxpayers with an average of $50 million or less in gross receipts over the previous three years may claim the federal R&D tax credit against their alternative minimum tax liability. The PATH Act also allows startup businesses with no federal tax liability and gross receipts of less than $5 million to take the R&D tax credit against their payroll taxes for tax years beginning after December 31, 2015, essentially making it a refundable credit capped at $250,000 for up to five years. Some common industries that qualify for the R&D tax credit include, but are not limited to: Manufacturing & Fabrication, Software Development, Engineering, Architecture, Pharmaceutical, Machining, Aerospace & Defense, Food & Beverage, Tool & Die Casting, Foundries, Automobile, and Chemical & Formula. The Research and Development tax credit is one of the most lucrative incentives under current U.S. tax law because it is a dollar-for-dollar reduction in a tax liability. Depending on a company’s qualified research expenses, the credit can include eligible wages, supplies, and outside contractor expenses. In addition to the federal component, the vast majority of states also offer some form of the credit with many of those states offering a permanent form of the credit (please see kbkg.com/research-tax-credits/state-benefits for a list of states offering a research credit). Federal statutes are generally open for three years from the filing date of a return. As such, taxpayers which did not take advantage of the credit and are seeking to do so can amend previous years’ returns and claim the benefits. Federal statutes also allow for unused credits to be carried forward for 20 years. To see if your company qualifies or if you have any questions regarding the research credit, please contact one of our R&D tax credit professionals (kbkg.com/research-tax-credits). Despite Congressional attempts to repeal the Affordable Care Act (ACA), the basic structure of the ACA for businesses, both large and small, generally remains intact. If an employer is an applicable large employer (ALE) based on the previous year’s employee head-count, employer shared responsibility provisions and employer information reporting provisions are triggered. Small businesses, however, are not unaffected by the ACA and should take the ACA into account in year-end planning. Some incentives in the ACA could help maximize tax savings for small businesses. Planning now, both to qualify for 2018 incentives and to meet 2019 compliance requirements, is advisable. Businesses considering expanding their payrolls before year end 2018 should look at this credit. The PATH Act has extended this program through December 31, 2019. Generally, the WOTC rewards employers that hire individuals from specified targeted groups, including veterans, families receiving certain government benefits, and individuals who receive supplemental Social Security Income or long-term family assistance. The WOTC is generally equal to 40 percent of the qualified worker’s first year wages up to $6,000 ($3,000 for summer youths and $12,000, $14,000, or $24,000 for certain qualified veterans). For long term family aid and unemployment recipients, the credit is equal to 40 percent of the first $10,000 in qualified first year wages and 50 percent of the first $10,000 of qualified second year wages. To reduce 2018 taxable income, consider disposing of a passive activity in 2018 if doing so will allow you to deduct suspended passive activity losses. If you own an interest in a partnership or S corporation, consider whether you need to increase your basis in the entity so you can deduct a loss from it for this year. Currently, owners of partnerships, S corporations, and sole proprietorships pay tax at the new individual rates, with the highest at 37%. Under pre-TCJA law, net taxable income from pass-through business entities (such as sole proprietorships, partnerships, S corporations and LLCs that are treated as sole proprietorships or as partnerships for tax purposes) was simply passed through to owners. It was then taxed at the owners’ standard rates. In other words, no special treatment applied to pass-through income recognized by business owners. If the 199A deduction is limited by taxable income, additional income may get a 20% deduction even if it’s not qualified business income (and not capital gains). When a taxpayer is within or over the phaseout range reducing income or increasing deductions can increase 199A deduction. Maximizing or minimizing depreciation and 179 deduction can be a useful tool to archive a bigger 199A deduction. The Enterprise Zones are a series of geographic areas in California where companies can receive special tax breaks. 2013 was the last tax year for which businesses could engage in qualified Enterprise Zone hiring or purchasing made prior to 12/31/2013. Even though businesses may no longer qualify additional employees for the Enterprise Zone tax credit, they may still generate additional credits until the end of 2018. The program was replaced with the New Employment Credit, a partial sales & use tax exemption, and the CA Completes Tax Credit. For tax years beginning on or after January 1, 2014 and before January 1, 2021, a nonrefundable credit against corporation franchise and income and personal income taxes is available to qualified employers that hire qualified full-time employees to work in a designated census tract or economic development area (EDA) provided the taxpayer pays qualified wages and satisfies other procedural requirements. A “designated census tract” is a census tract determined by the Department of Finance to be in the top 25% of California census tracts in terms of civilian unemployment and poverty rates. For purposes of this credit, “economic development areas” are specified former enterprise zones or LAMBRAs. (Sec. 23626 (b) (7) and (8), Rev.& Tax. Code) A map and search tool with all of the designated census tracts and economic development areas is available on the FTB’s website at: http://maps.gis.ca.gov/gobiz/dga/default.aspx. In addition, an annual certification of employment is required with respect to each qualified full-time employee hired in a previous taxable year. To be allowed a credit, the qualified taxpayer must have a net increase in the total number of full-time employees in California. The California Competes Tax Credit is an income tax credit available to businesses that want to come to California or stay and grow in California. The credit is based on numerous factors including the number of jobs created, geographical location, compensation paid to employees, and overall business economic impact. Tax credit agreements will be negotiated by GO-Biz and approved by a statutorily created “California Competes Tax Credit Committee,” consisting of the State Treasurer, the Director of the Department of Finance, the Director of GO-Biz, one appointee each by the Speaker of the Assembly and Senate Committee on Rules. This credit is available through 2018 tax years for contributions made to the College Access Tax Credit Fund. The credit will be available to taxpayers who make cash contributions to the fund and who receive a credit certification and allocation from the California Educational Facilities Authority (CEFA) in the State Treasurer’s Office. The fund will be used to bolster the dwindling resources used to provide Cal Grants to low-income college students. Taxpayers may claim credits for 50% of the amount contributed that is certified and allocated for the 2018 taxable year. The credit can be used to offset tax, including reducing the tax below tentative minimum tax. You must receive a certificate from CEFA before you can claim the credit on your state income tax return. You may also be able to claim a charitable deduction on your federal tax return. If you do this, you must add back the amount of the charitable deduction taken on your federal return as a state adjustment on your California tax return. You cannot claim a deduction and a credit for the same contribution.